Twentieth Century Discovery offers a lively and erudite survey of some of the extraordinary changes that have taken place in scientific thought and action since 1900—exploring both the heavens and the sub-microscopic world of the atom, and relating both domains to the visible world of mankind. 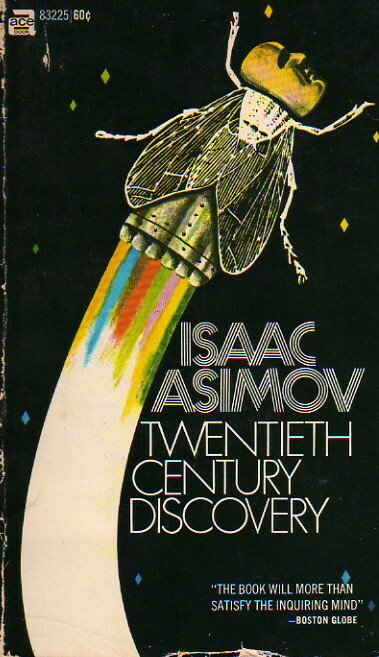 Isaac Asimov offers here an informative, often witty, capsule history of modern scientific investigation which will be welcomed by his enthusiastic and myriad readers. This is a book which I have a hard time evaluating, because, on the one hand, I am very fond of it—it’s among the earlier items in my Asimov collection, purchased back in the days when sixty cents would buy a good paperback book, and I’ve read it with pleasure over and over for nearly forty years, but the fact is that it’s become rather dated. Actually, that is as one should expect in a sense. The whole purpose of the book is to talk about some of the wonderful and unexpected things that science and technology have done over the course of the twentieth century, so it shouldn’t be surprising that in that third of the century which lies between publication of the book and the century's end, science and technology should continue to have surprised us. It’s divided into five chapters, all five of which have been battered by the passage of time—so far as I know. The first discusses the development of insecticides, from the earlier chemical versions like DDT to the experimental, hormone-based insecticides of the 1960’s. This is not an area I know much about, but I do know that hormone-based insecticides aren’t being used much as of 2010, but DDT and its cousins continue to be the main stay of the business, so I can only conclude that the promise of the chemicals of the 1960’s has not panned out. Similarly, the second chapter deals with advances in learning about the origins of life, but I’m not aware of any significant advances in the field since the late 1960’s. Again, this is out of my area of expertise, so I could be wrong. As for the last three chapters—on the structure of matter, on discoveries in space, and on space flight itself, it goes almost without saying that a big chunk of current knowledge and experience is missing. Just to name a single example, Asimov wrote before Apollo 11, before the Voyager or Viking probes, before the space shuttle and Hubble Space Telescope—before an awful lot. Our knowledge of the worlds surrounding the Earth is enormous compared to the late 1960’s. In short, this is a nice enough book—although there’s little here that isn’t in books such as The Intelligent Man’s Guide to Science and its descendants—but it badly needs to be updated or completely rewritten before it can be anything other than a historical curiosity.